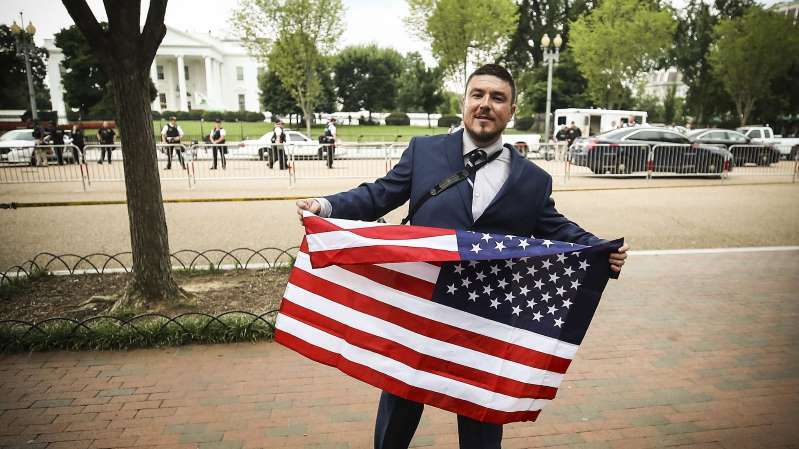 Jason Kessler, who organized the Unite the Right 2 rally for white nationalists and white supremacists, holds up an American flag, largely alone. District of Columbia — It was supposed to be the start of another show of force by white nationalists: Unite the Right 2, the follow-up to last year’s disastrous and violent demonstrations in Charlottesville, Virginia, which concluded with a Nazi sympathizer ramming his car into a crowd of counterprotesters, injuring several and killing one. But Dan, who said he was a supporter of “peaceful” ethnic cleansing, was the only white nationalist to be seen at the march’s starting point, the Foggy Bottom metro station. [post_ads]What Dan didn’t know was that his friends had already left. A couple hours before the march was supposed to start, around 25 white nationalists, led by rally organizer Jason Kessler, had arrived at Foggy Bottom. Instead of waiting around, and swarmed by media, police, and a lot of counterprotesters, they had forged on ahead on the march route hours earlier than scheduled. There, Kessler complained to reporters about the police in Charlottesville and counterprotesters, and then left. So by the time I had asked Dan where his white nationalist friends were, the rally had ended — a half hour before 5:30 pm, when it was supposed to begin. It was a total dud. There were plenty of reasons for the pathetic display. But the basic issue is that Charlottesville was a complete disaster — a moment that was supposed to somehow win white nationalists favor, but actively turned much of the nation against them when they engaged in violence and, in one case, literal murder. Organizers of the 2017 Unite the Right have been embroiled in lawsuits filed by victims of the violence that took place. Many of the alt-right’s biggest personalities, like Richard Spencer, lost funding platforms because, understandably, platforms like Patreon and PayPal didn’t want to be associated with advocates for the return of the Third Reich. Other alt-right figures are involved in legal proceedings related to, for instance, harassing a Jewish woman online, or participation in a trailer park brawl. One white nationalist attendee (best known for sobbing uncontrollably at the thought of his imminent arrest) was even recently banned from entering the state of Virginia. Kessler himself tweeted insults about the young woman killed during the rally, then blamed his tweets on a combination of Ambien and Xanax when even his fellow rallygoers disavowed him. And politically, the rally only served to, in the words of the New York Times, “empower a leftist political coalition that vows to confront generations of racial and economic injustice” in Charlottesville. Coupled with a total lack of serious organization that led some marchers to go ahead of others hours ahead of time, this was all too much for the demonstrations — and they ended before they could really begin. In fact, counterprotesters outnumbered white nationalists by the hundreds at the DC rally — to the point that some counterprotesters left early because it was kind of boring. As I arrived at the counterprotests, one of the people leaving said that there “aren’t enough Nazis to troll.” So she took her sign — a mock-up of a Confederate flag with “losers” written along the flag’s stripes — home. Of course, this does not mean that racism has been defeated and all is well in America. It has, after all, only been a year since Charlottesville. That’s a year since Donald Trump, as president, said that there were “some very fine people on both sides” at the Charlottesville rally, in which one side contained literal neo-Nazis. And that followed a campaign for the presidency in which Trump made all sorts of racist remarks, from characterizing Mexican immigrants as criminals and rapists to suggesting that all Muslims should be banned from America. And there’s plenty of research showing that Americans still harbor racism and racial resentment, from studies finding that people are more likely to see black children as less innocent to other research finding that white people view Muslims, Arabs, and Mexican immigrants as less human than Americans and Europeans. But, at least for today, the white nationalists couldn’t field enough people for an actual rally.